“Preacher’s Sons” is a provocative chronicle of five troubled boys; the two men who adopt them; and the four cities that alternately accept them (Los Angeles), revile them (Grand Rapids), exclude them (Reno), and lionize them (San Francisco). Join the fledgling Stewart family on their five-year, emotionally charged odyssey through the American heartland. Marvel, as they meet racism and homophobia with faith and irreverent humor. Observe five all-but-lost boys becoming a true band of brothers. And find out what really happens behind the minister’s closed doors, in this intimate, moving, and humorous portrait. The preacher is the Rev. Greg Stewart, who started this journey as our minister of religious education at Neighborhood Unitarian Universalist Church, where I am a member. The filmmakers, Mark and C, followed Greg and his family over a 5 year period. Tragically, shortly after completing the film, Mark was diagnosed with cancer and passed away a couple weeks ago. This is the first public screening of the film and it is a benefit for the family’s medical expenses. It is exciting too that the film’s subjects, Greg, Stillman and their 5 boys, will be coming down from San Francisco for the screening. I encourage you not to miss this wonderful opportunity to see this special film. I hope you to see you there. When I was growing up, my dad was a war history buff and family vacations often included visiting battlefields and war monuments. Mostly I hated it, angry about what I thought was a glorification of violence. In school, history was one of my least favorite subjects because it seemed to focus almost solely on war. I am perhaps not the most likely candidate to design a war memorial. I’m not even Filipino. But I love a challenge! And I am grateful to City Council President Eric Garcetti (CD13) for giving me that challenge. 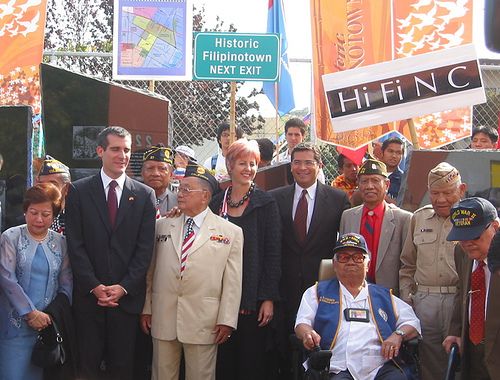 I was asked to design this Filipino World War II Veterans Memorial almost three years ago. When art consultant Lesley Elwood told me the veterans’ story, I was intrigued. 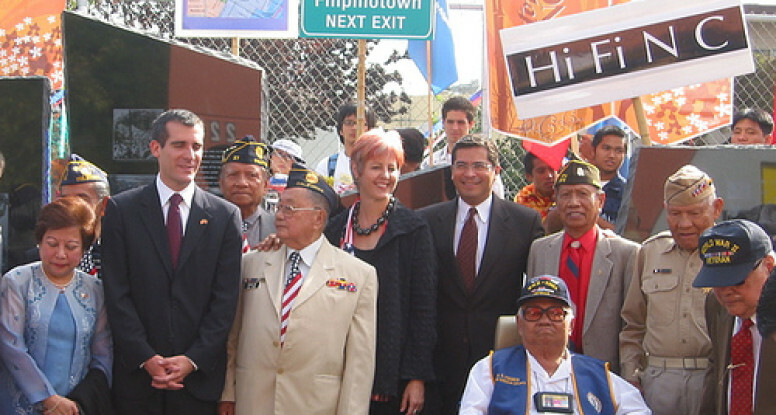 Then Joseph Bernardo from Eric Garcetti’s office took me to the Filipino American Services Group to meet two veterans. I came into their tiny office with maps and photos on the walls. They were in the 80s and full of passion as they told me their stories and I strained to understand their words and the horrors of what they were describing. These men brought their war experience alive for me and I was moved. It has been said that as a people we are doomed to repeat history if we do not truly understand our past. These men were once young and full of optimism and hope. They willingly stepped forward to serve our country. Thousands of them faced horrific torture, thousands did not survive. Civilian men and women were deeply affected too. They all have memories that they live with every day. No longer young, these same men and women are still full of optimism and hope that we as a people and government will give them the respect, honor and benefits that they were promised and so deserve. I have been honored to tell their story and to use my skills as an artist to draw attention to their plight. On this historic day, let us all understand history and not be doomed to repeat it. Let us honor their valor by making sure that injustice and unfair treatment of our veterans will never happen again.